I know this doesn't have anything to do with finances, but remember that being a good steward also involves the stewardship of our time and our talents. That said, a few years ago I spent no small amount of time and effort transcribing soundtracks and compiling all the lyrics for a White Christmas Sing-Along. I was rather surprised to not find it all on the internet, neatly organized and ready to go. 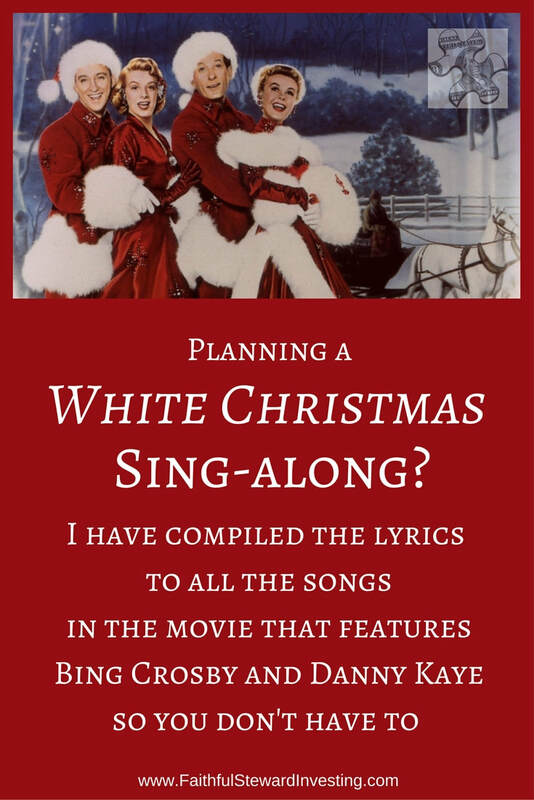 Having gotten the idea for the Sing-Along from a local community event, I can imagine there surely must be others who have had the same idea and would benefit from having all the lyrics, in order, for their own White Christmas traditions. So, if you're one of those people, in order to save you quite a bit of time and effort and allow you to share in the benefit of my endeavor, here are all the words to the musical, as performed by the Crosby-Kaye-Ellen-Clooney cast. I have compiled all the words to all the songs in sequential order, and formatted it for printing. You can purchase this document and download it right away. Order these lyrics in PDF format for only $2.99 for immediate download. You can then print full-page copies or in booklet form as you choose. This document includes all the words to all the songs. "I'd Rather See a Minstrel Show"
​Thank you for visiting. I hope you found this to be helpful. Please take a minute to poke around my website and learn about investing for income. Faithful Steward Investing is a site focused on teaching the principles of providing for the future with closed-end funds. Its previous model was primarily devoted to biblical principles of personal money management, which can still be accessed through its teaching platform Faithful Steward Academy.